Levi Willey was born 1812 in North Carolina and died Feb. 1896 in Alleghany Co., NC. He married (1) Nancy Billings, abt. 1841. She was born 1822 in North Carolina and died bet. 1870-1875 in Alleghany Co., NC. He married (2) Martha "Patsy" Fender, daughter of John FENDER & Martha TOLIVER, Apr. 22, 1875, in Alleghany Co., NC. She was born Feb. 13, 1836, in Ashe Co., NC, and died Nov. 30, 1897, in Alleghany Co., NC. Levi Willey and his first wife, Nancy Billings Willey, are buried at the Levi Willey Cemetery on Road 1417, Alleghany Co., NC. Martha Fender Willey is buried at the Pleasant Home Union Baptist Church, Road 1412, Alleghany Co., NC. +Sarah Willey, b. abt. 1842, Ashe Co., NC; d. Nov. 11, 1884, Alleghany Co., NC; m. Hiram S. EDWARDS, son of Berry EDWARDS, Sr., & Ruth DAVIS, Apr. 5, 1866, Alleghany Co., NC (b. Feb. 2, 1838; d. July 3, 1909); bur. Center Edwards Cemetery, Alleghany Co., NC. Elizabeth "Bettie" Willey, b. Aug. 10, 1844, Ashe Co., NC; d. July 30, 1898, Alleghany Co., NC; m. Solomon FENDER, son of Allen FENDER & Nancy EDWARDS, Nov. 2, 1865, Alleghany Co., NC (b. abt. 1845; d. July 2, 1902); bur. Levi Willey Cemetery, Alleghany Co., NC. Charity Willey, b. Oct. 27, 1848, Ashe Co., NC; d. Feb. 13, 1891, Alleghany Co., NC; m. Isaiah SPARKS, son of Reuben SPARKS & Nancy MCGRADY, Jan. 1, 1871, Alleghany Co., NC (b. abt. 1851; d. 1883). Isaiah SPARKS is not listed with Charity in the 1880 census. He reportedly died in 1883 in Raleigh, NC, where he was imprisoned after being charged with horse theft by Col. Granville WILLEY. Children of Levi Willey & Martha "Patsy" Fender: none. evi Willey (1812-1896) lived on Jewel Swamp Creek and the Little River in northern Alleghany County. He may be the brother of Samuel Willey and Andrew Willey, who also lived in Ashe/Alleghany County during the same time period. However, there's no direct proof of their relationship. Levi's father has never been identified, but his mother is undoubtedly the Catherine Willey (age 80), who was living with his family at the time of the 1850 census. 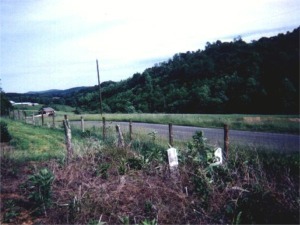 Levi Willey is buried at a family cemetery on Road 1417 in Alleghany Co., NC. His gravestone reportedly states that he was born in 1812 (see Alleghany County Cemeteries Through 1986, pub. by the Alleghany Co. Hist.-Gen. Society). Others buried in this cemetery include Katie Willey (probably Levi's mother) and his first wife Nancy Billings Willey. Click here for several Willey cemetery photos taken by Carolyn Willey Spence. -- Martha, 44, wife, " " "
-- William, 15, son, " " "
-- Granville, 14 B, servant, " " "
-- John, 12 B, servant, " " "
HICKS, Laura, 16, servant, " " "